Happy New Year’s Eve Lovelies! 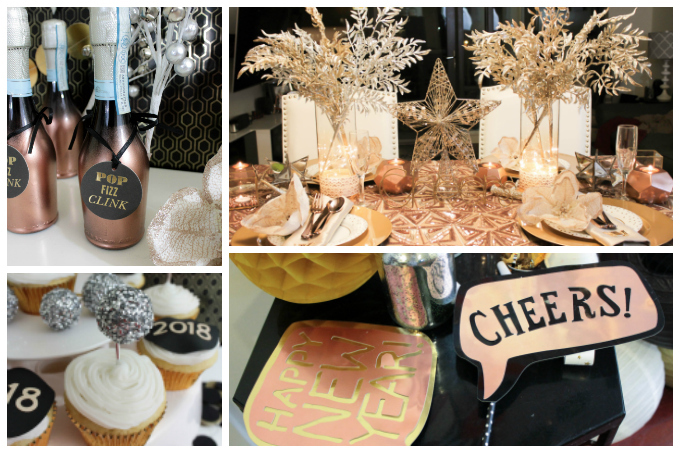 This year we planned really fun, yet chic New Year’s Eve party that is full of fabulous ideas. 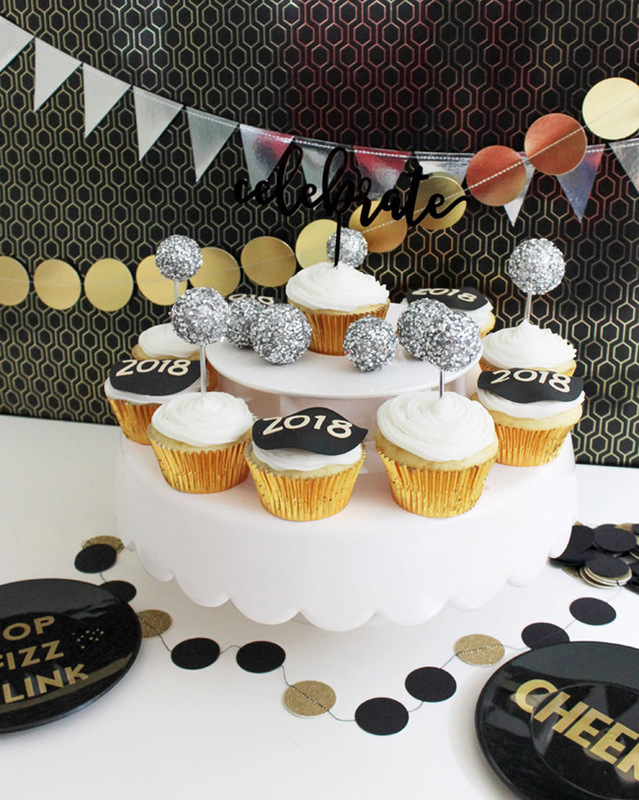 New Year’s Eve is one of our favorite holidays of the year and we love doing something special for it by throwing a party for my family and friends. 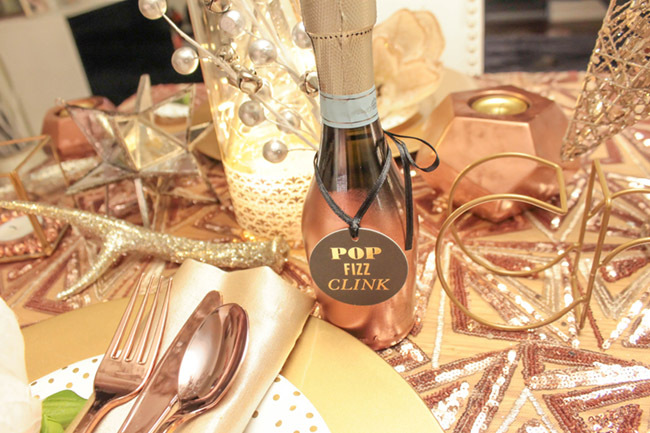 Just wait until you see this sparkly rose gold new years eve party that we put together! We can’t wait to show you! 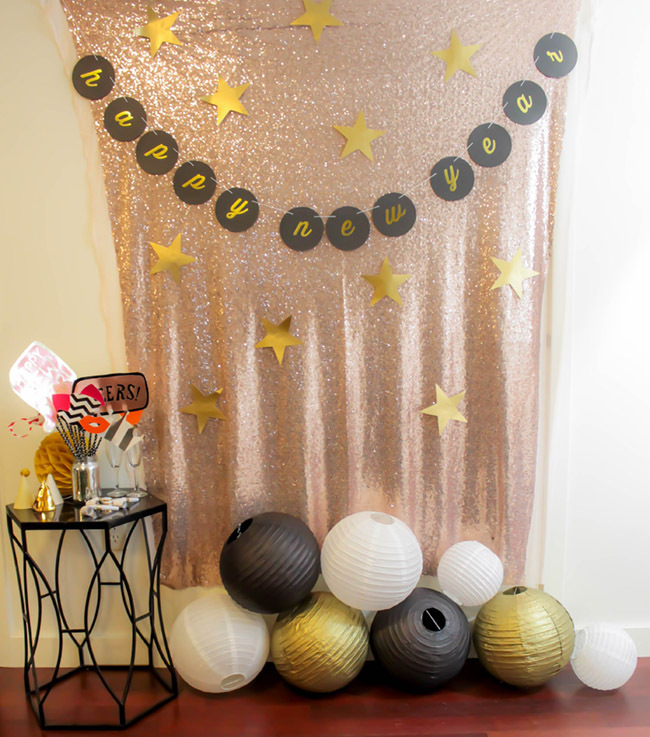 We pulled from all of my favorite party trends like metallic rose gold and geometric details to style this party. 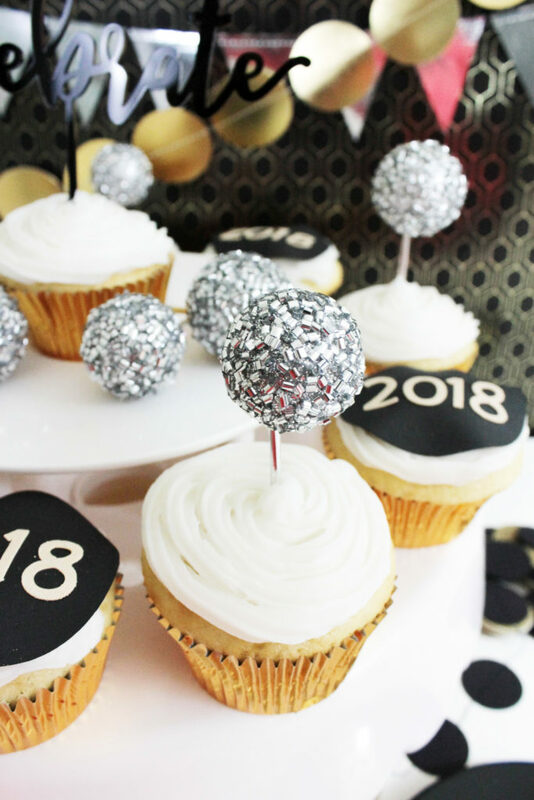 From cupcakes with ball drop toppers to photo booth props, champagne favors and a gorgeous geometric themed tablescape, we’ll take you through all of our favorite lovely details that make up our fabulous sparkly rose gold New Year’s Eve party! 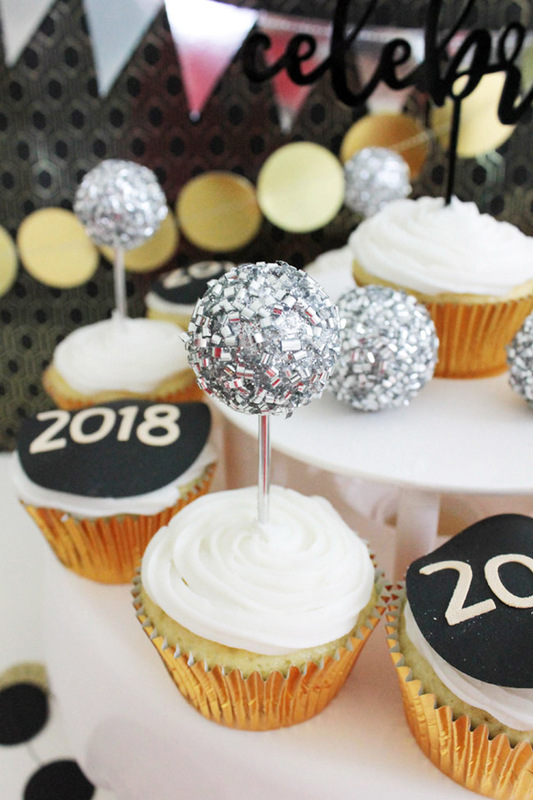 These cupcakes are all about New Year’s Eve celebrations. 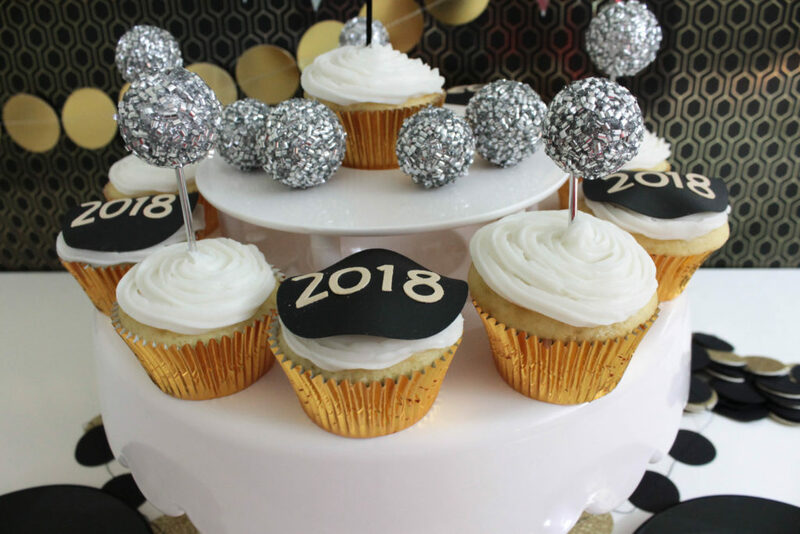 We added these cute ball drop cupcake toppers and 2018 decorations to help ring in the new year. 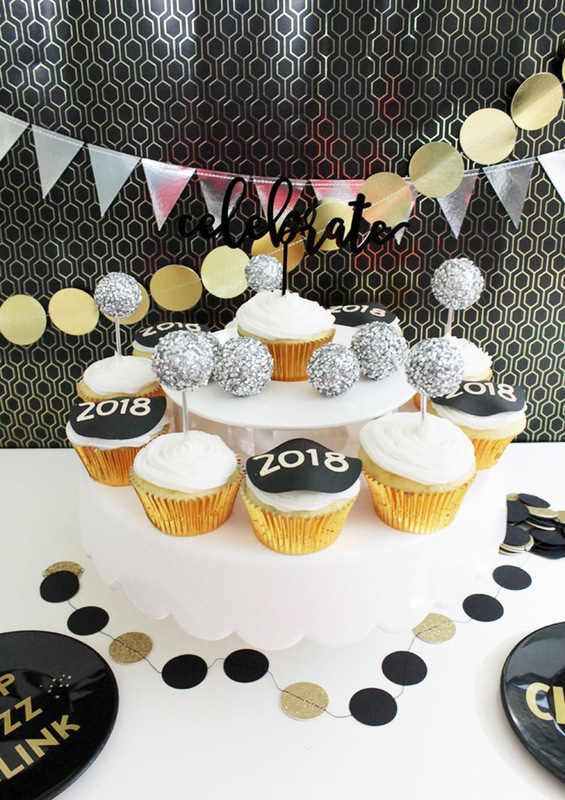 They are fun and so easy to put together and use sugar sheets to make to toppers. Pretty neat! 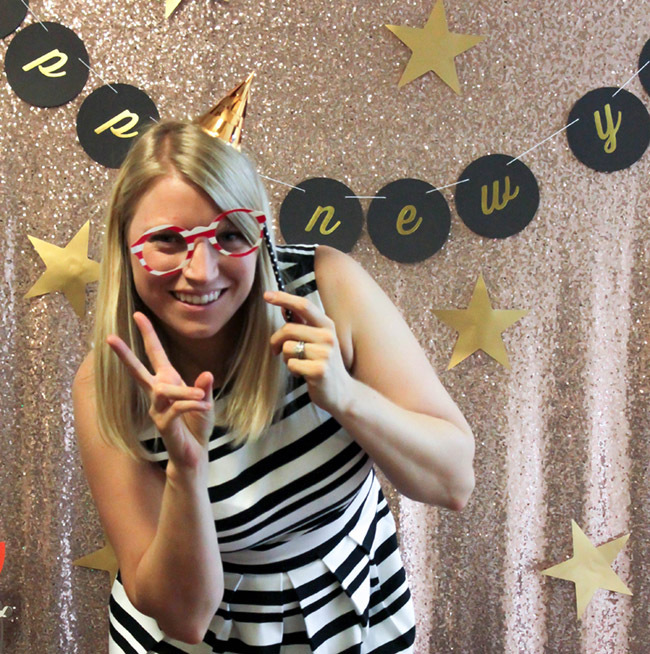 Your New Year’s Eve party is already going to be fun, but having a photo booth just escalates it to a new level. With the help of a few DIY props, a beautiful backdrop and a camera, your guests will be ready for to say cheese in no time! Jo-Ann Fabric & Craft Stores has some gorgeous fabric. 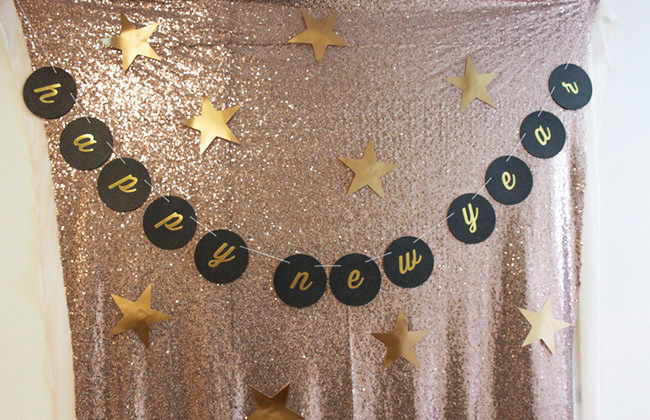 To stick with the rose gold theme that for this New Year’s party, I selected this lovely rose gold sequin fabric and got 2 yards of it. 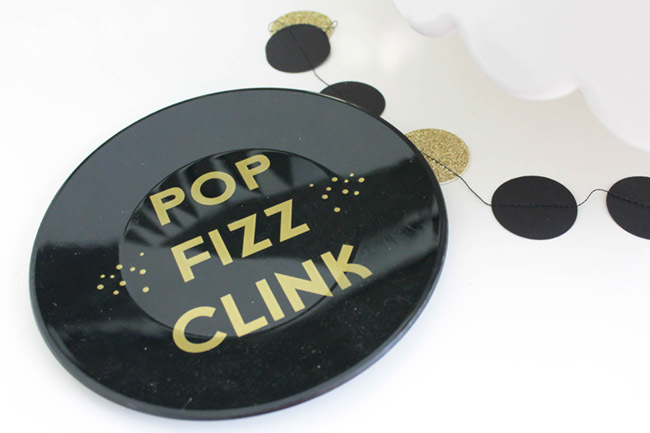 These DIY paper plate photo props are so cute and they are easy on the budget. Follow along this tutorial we did earlier this year to make your very own set of paper plate photo props! 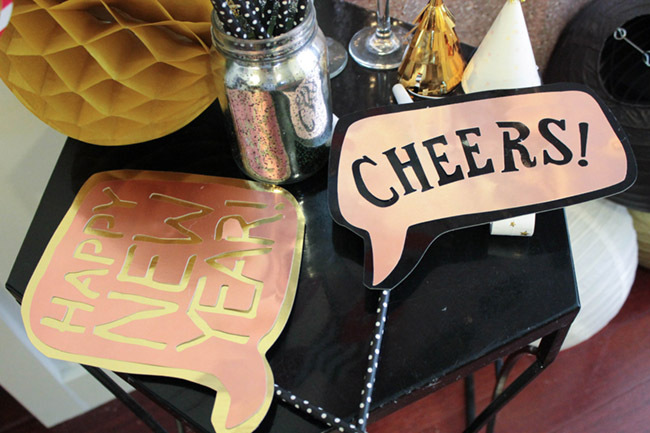 In addition to the paper plate photo props, we also made these New Year’s photo booth signs with our Cricut to tie into the occasion. 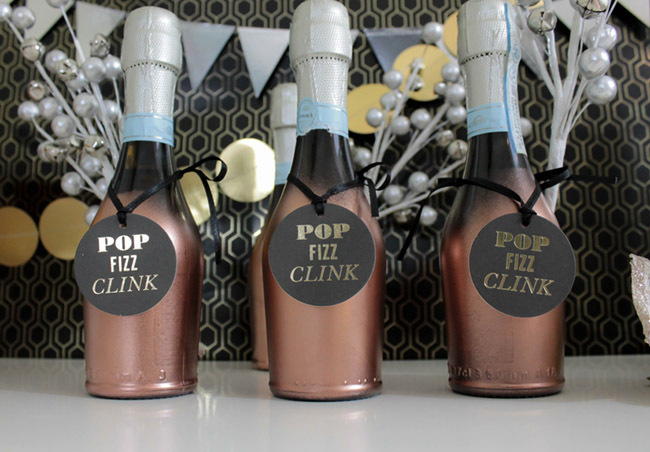 Next, you’ll want to get your New Year’s Eve party favors ready. 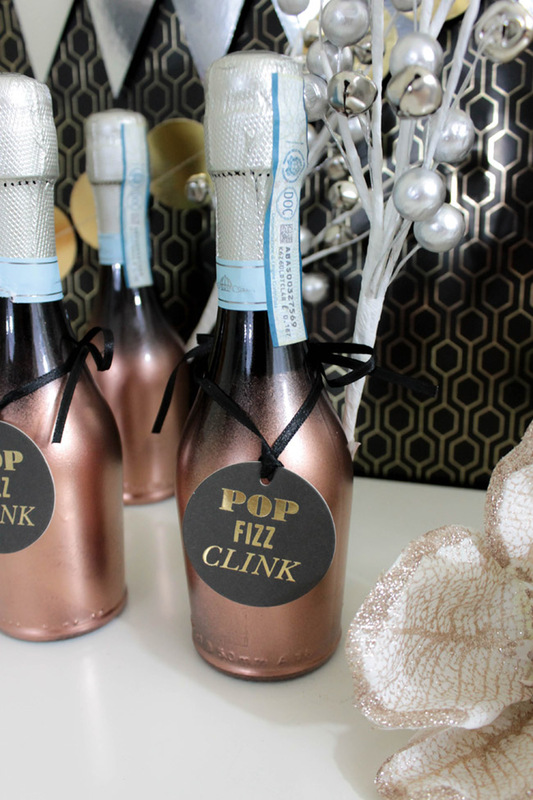 Since New Year’s Eve is a great time to pop the bubbly, we like to send my guests home with a little bubbly of their own. 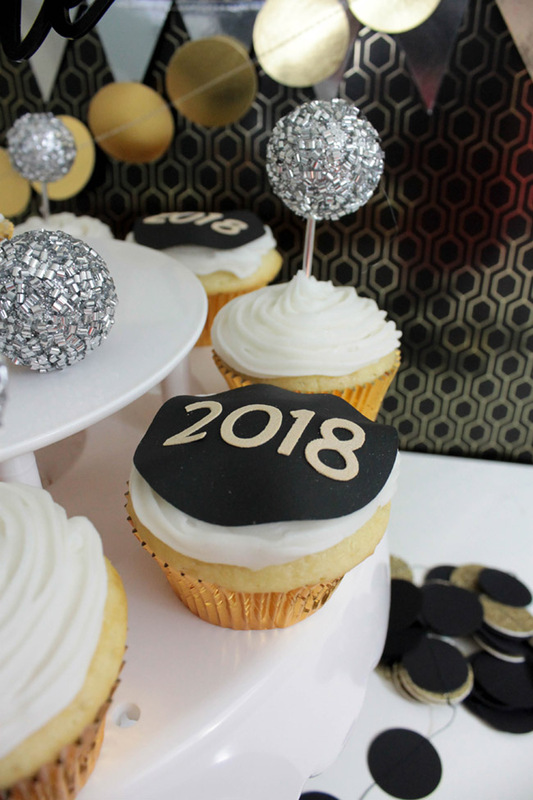 A great place for these is right by the cupcakes you made earlier so everyone can see them when they go in for their New Year’s treat. You can also set them up on their own table close to the door for people to grab before they head out. 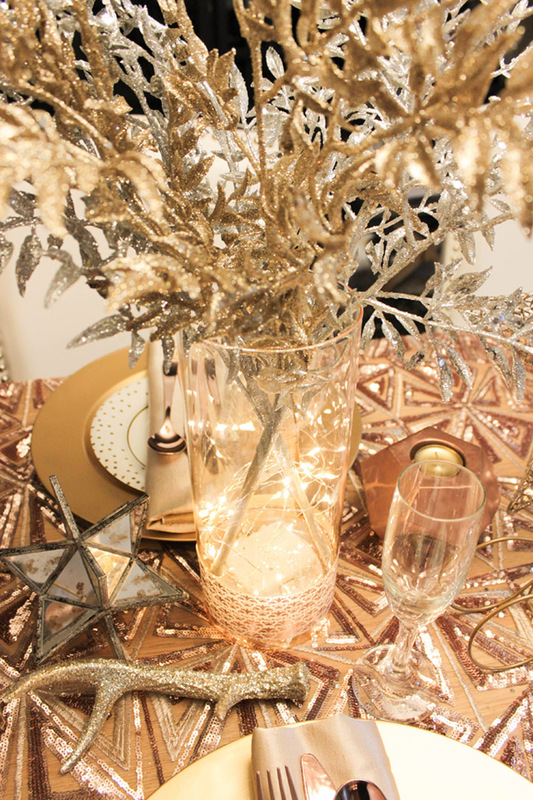 You will really wow your guests with this sparkly rose gold New Year’s Eve Tablescape. There are so many intricate details that your guests will love. 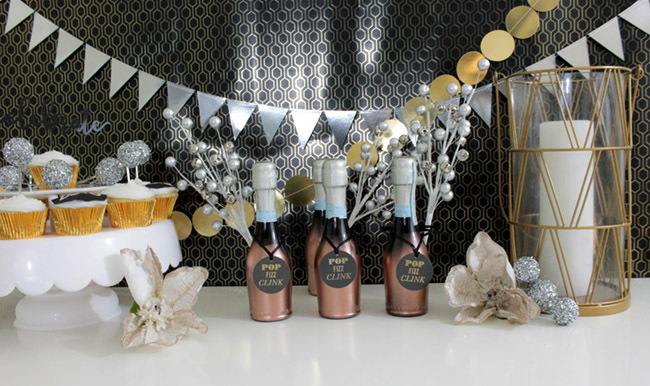 It really brings the rose gold look to a whole new level and is the perfect theme to help ring in the New Year in a magical way! 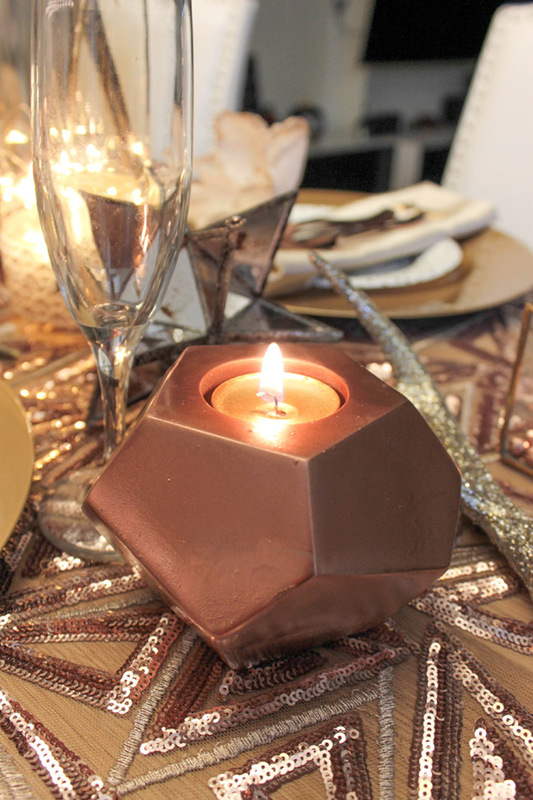 We picked up these chic geometric votive candle holders (on sale!). They come in all different geometric shapes and sizes which we love. Geometric décor is very trendy and is a great way to bring in a modern touch to your decorations. 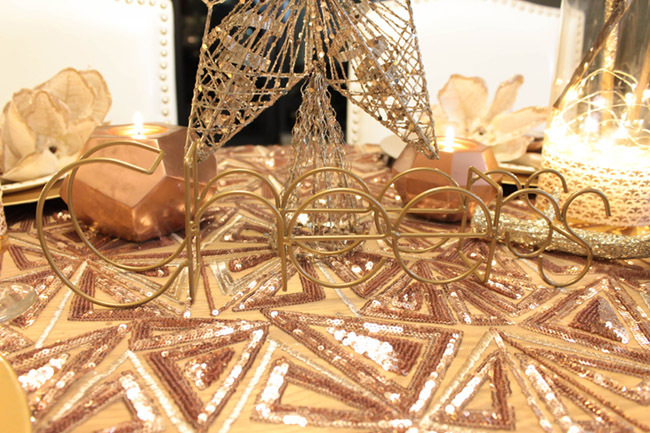 They are great on their own, but to coordinate the best with the theme of the table, we knew they needed a little rose gold paint so we spray painted them! You can put these beautiful gold votive candles in them too. Together, they have such a statement. The glow that these bring to the table is gorgeous. 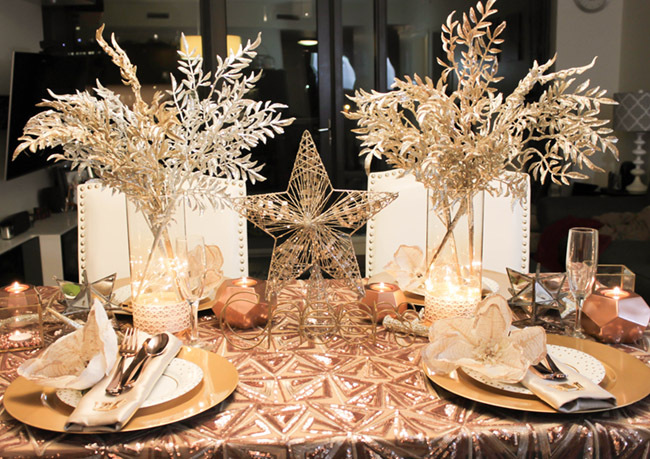 This New Year’s Eve Centerpiece is sparkly and bright. Exactly what a New Year’s Party should be all about! With a few easy steps, you can put together this pretty piece in no time. Isn’t this tablecloth just phenomenal? The triangle geometric pattern with the rose gold sequins is fabulous. This is the most lovely fabric that I got from Jo-Ann Stores and placed over the table as a table cloth. 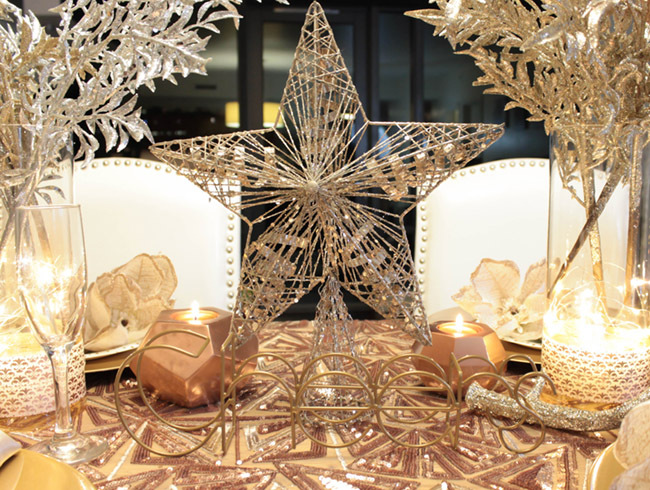 Jo-Ann has these wonderful geometric antiqued stars that coordinate well and bring that magical starty night feeling to the table. 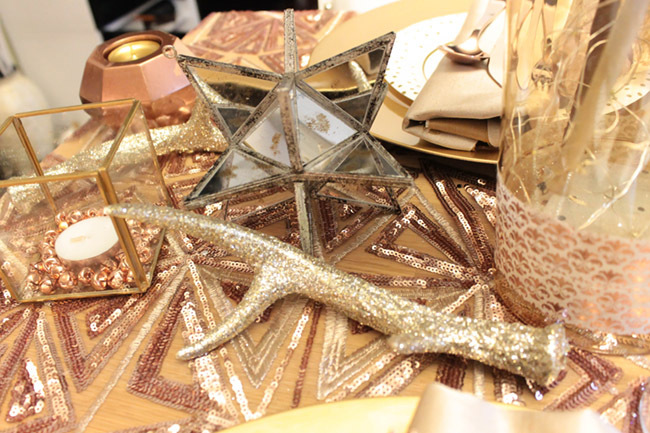 They also have these lovely glitter antler picks that bring that added sparkle to the table. They add this natural dimension that we love too. 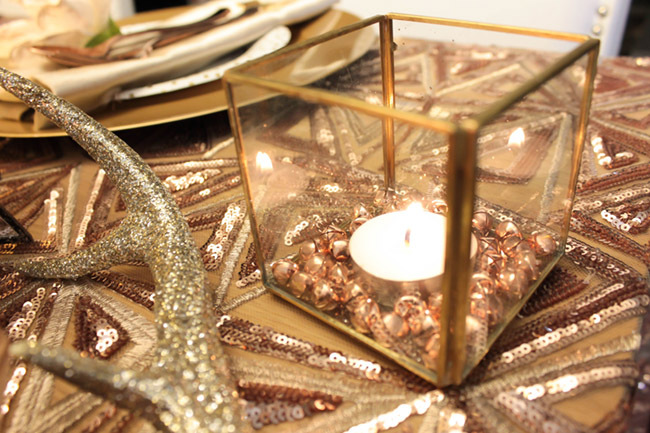 We also added these gold square votives to the table to further add to the geometric theme. Added rose gold bells made a festive detail to house the votive candle inside. 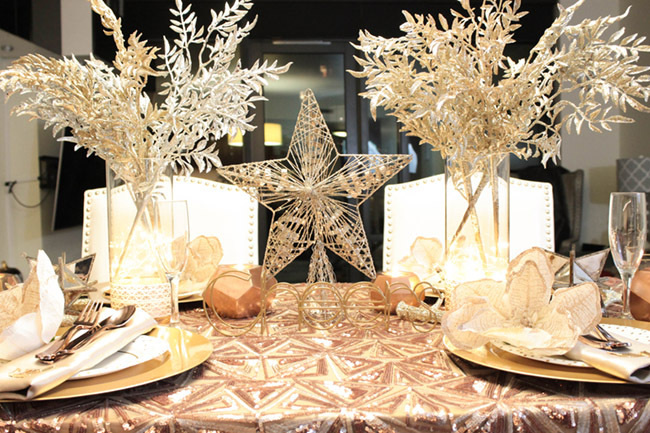 We love this star tree topper as the main focal point of the tablescape. The sparkly design and ribbon detail is perfect New Year’s Eve. 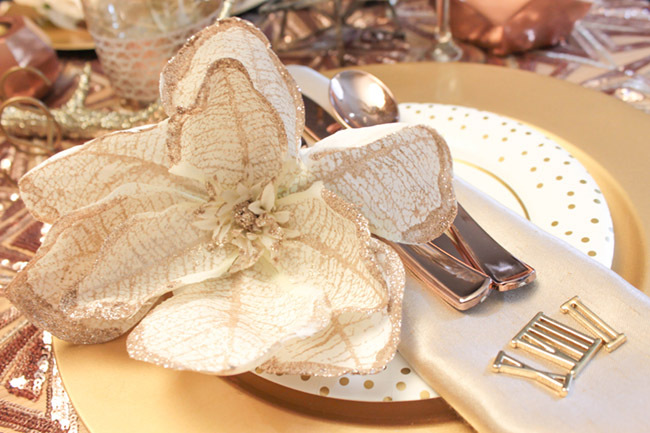 Each place setting had this lovely sparkly rose gold poinsettia detail on them which is so darling. 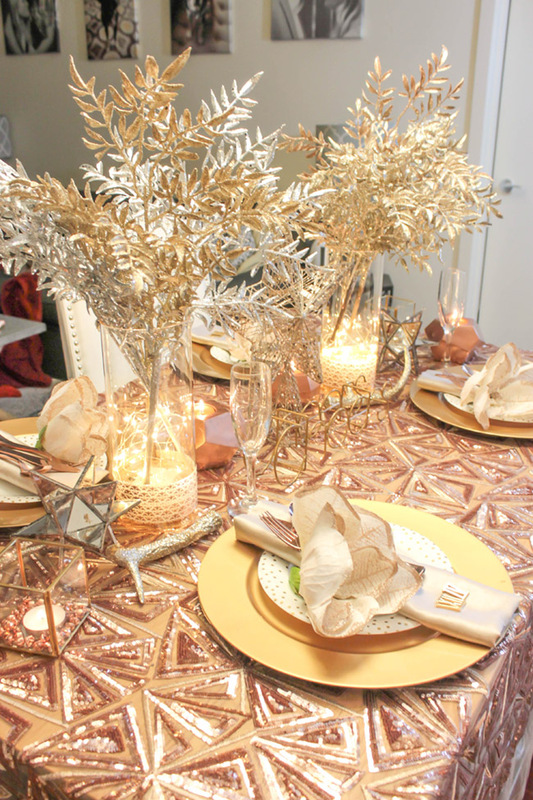 Gold chargers and confetti plates made for fun yet chic look. To top it all off, a satin linen napkin overlayed the entire look. Fun roman numeral charms were added to each napkin to bring the whimsical element of the new year’s clock to the table. 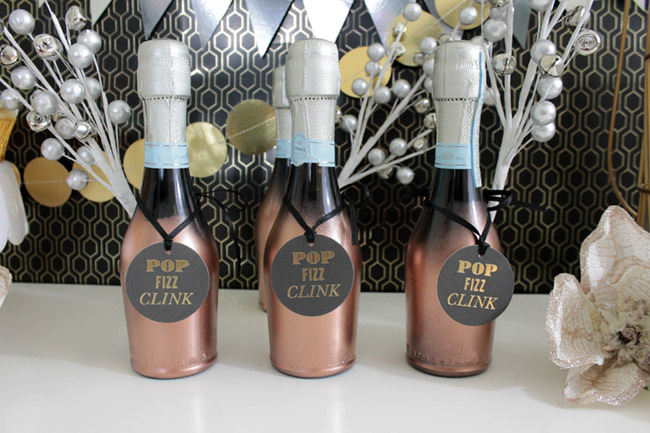 The champagne favors that we crafted look great on the tablescape too if you want to offer them there too! Cheers! 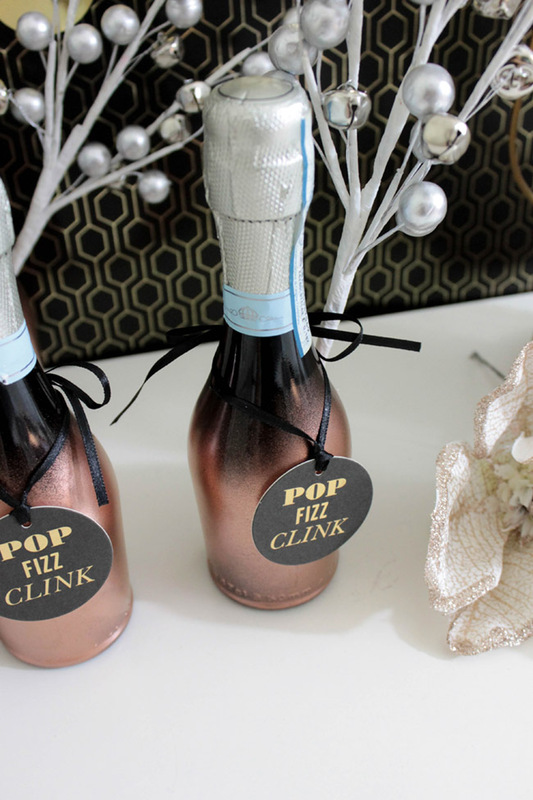 Here is to a magical, sparkly New Year’s Eve! 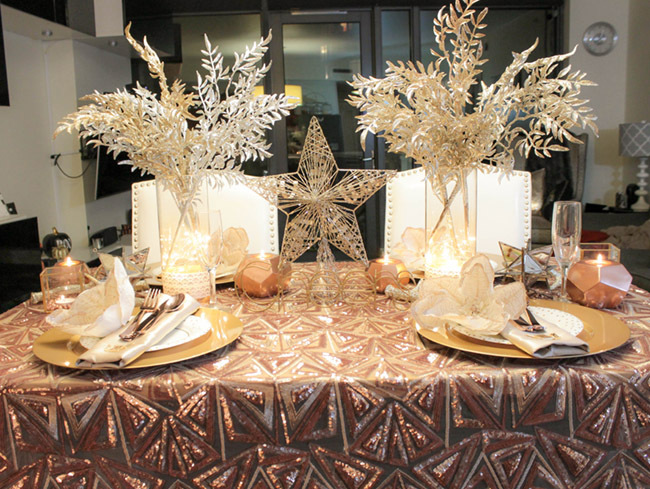 New Year’s Eve Party Inspiration Of The Day Lovely Metallic & Sparkly Thanksgiving Tablescape! 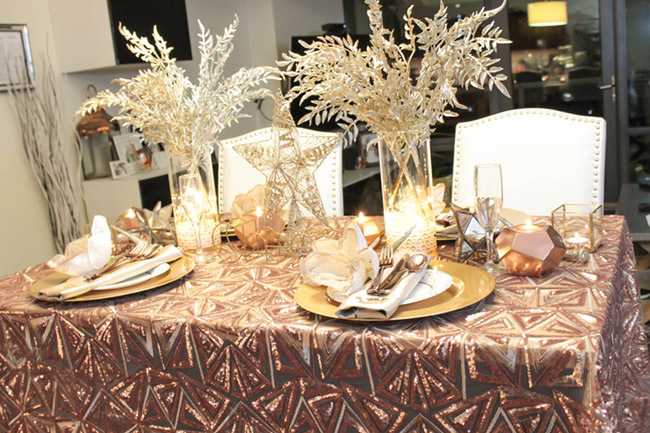 Gobble Gobble, It’s a Lovely Rose Gold Thanksgiving Tablescape! A few days ago I ordered a few rose gold pieces and I am on pins and needles waiting for them to arrive. Thank you for the inspiration and Happy New Year!inspiration.